Rapid diagnostic tests detecting microbial resistance are needed for limiting the duration of inappropriateness of empirical antimicrobial therapy (EAT) in intensive care unit patients, besides reducing the use of broad-spectrum antibiotics. We hypothesized that the betaLACTA® test (BLT) could lead to early increase in the adequacy of antimicrobial therapy. This was a case-control study. Sixty-one patients with BLT-guided adaptation of EAT were prospectively included, and then matched with 61 “controls” having similar infection characteristics (community or hospital-acquired, and source of infection), in whom EAT was conventionally adapted to antibiogram results. Endpoints were to compare the proportion of appropriate (primary endpoint) and optimal (secondary endpoint) antimicrobial therapies with each of the two strategies, once microbiological sample culture results were available. Characteristics of patients, infections and EAT at inclusion were similar between groups. Nine early escalations of EAT occurred in the BLT-guided adaptation group, reaching 98% appropriateness vs. 77% in the conventional adaptation group (p < 0.01). The BLT reduced the time until escalation of an inappropriate EAT from 50.5 (48–73) to 27 (24–28) hours (p < 0.01). Seventeen early de-escalations occurred in the BLT-guided adaptation group, compared to one in the conventional adaptation group, reducing patients’ exposure to broad-spectrum beta-lactam such as carbapenems. In multivariate analysis, use of the BLT was strongly associated with early appropriate (OR = 18 (3.4–333.8), p = 0.006) and optimal (OR = 35.5 (9.6–231.9), p < 0.001) antimicrobial therapies. Safety parameters were similar between groups. Our study suggests that a BLT-guided adaptation strategy may allow early beta-lactam adaptation from the first 24 hours following the beginning of sepsis management. Sepsis remains a major cause of mortality among patients admitted to the Intensive Care Unit (ICU) . Among determinants of sepsis-related death, the adequacy of empirical antimicrobial therapy (EAT) and the rapidity of its initiation are the most important protective factors [2, 3]. Due to the increased incidence of extended-spectrum beta-lactamases (ESBL)-producing Gram-negative bacilli (GNB), carbapenem consumption has rapidly increased worldwide, reaching for instance +30% in French ICUs between 2008 and 2011 . This in turn favours the emergence of carbapenemase-producing Enterobacteriaceae . To minimize the individual risk of an inappropriate EAT and at the same time the societal risk of excessive broad-spectrum beta-lactams consumption, early initiation of broad-spectrum EAT is recommended, followed by its de-escalation as soon as the results of antibiotic susceptibility tests (AST) are available [6, 7]. However, this conventional AST-guided de-escalation occurs 48 to 72 hours after initiation of EAT . On one hand, this time is too long for the 10–30% of patients treated with inappropriate EAT [3, 9–11]; on the other hand, this time is sufficient for the carriage of carbapenem-resistant bacteria to emerge . Thus, strategies for limiting the duration of EAT inadequacy, at the same time as reducing the use of broad-spectrum beta-lactam antibiotics are urgently needed . The betaLACTA® test (BLT) is a chromogenic diagnostic device detecting resistance of GNB to 3rd generation cephalosporins (3GC) due to β-lactamases from ESBL, carbapenemases or acquired AmpC classes, in less than 20 minutes. The BLT showed interesting intrinsic diagnostic performance in laboratory evaluations, notably sensitivity and specificity >95% for ESBL detection on Enterobacteriaceae colonies [14–17]. However, to our knowledge, a BLT-guided antimicrobial adaptation strategy has never been investigated in the clinical setting. We hypothesized that a BLT-guided strategy could lead to earlier improvement in the adequacy of EAT compared to a conventional strategy in ICU patients with Enterobacteriaceae-related infection (i.e. escalation in the case of inappropriateness or de-escalation in the case of treatment being too broad-spectrum). Our primary aim was to assess a BLT-guided strategy to improve the proportion of appropriate antimicrobial therapy once the results of the microbiological sample cultures were available. Our secondary aim was to assess a BLT-guided strategy to improve the proportion of optimal antimicrobial therapy. See “Additional methods” (Additional file 1). This case-control study was conducted following the Strengthening of Reporting in Observational studies in Epidemiology (STROBE) statements  and was approved by the Institutional Review Board (Comité de Protection des Personnes “Ile de France VI”, Paris, France, ID-RCB 2015-A00169-40), and by the French national commission on digital storage of personal data (CNIL, number 1832114). Information was given to patients or next of kin, who could decline inclusion in the study. After BLT introduction as a routine susceptibility test in our laboratory in January 2014, all ICU patients were screened daily for eligibility as “cases”. Eligibility criteria were the presence of an active infection caused by at least one Enterobacteriaceae species and requirement of EAT. Exclusion criteria were: (1) antimicrobial therapy withdrawal within the first 48 hours of treatment and/or diagnosis reclassification from infection to colonisation, (2) existence of a concomitant infection preventing antimicrobial de-escalation or (3) a moribund patient or a patient in whom a procedure of withdrawing life-sustaining treatment was decided. “Cases” (i.e. patients with BLT-guided EAT adaptation) were consecutively and prospectively included among eligible patients. One “control” (i.e. a patient with AST-guided EAT adaptation), matched both on the site and the community-acquired or healthcare-associated status of the infection, was recruited per case among the last patients who presented an Enterobacteriaceae infection before introduction of the BLT. The composition of the EAT was prescribed according to local practice guidelines adapted from international guidelines (see Additional file 2). Cefotaxime was selected for community-acquired and early-onset nosocomial infections. Piperacillin-tazobactam, cefepime, imipenem-cilastatin, doripenem or meropenem were selected for late-onset nosocomial infections. An aminoglycoside was added in the case of septic shock or in high suspicion of Pseudomonas aeruginosa. ICU physicians and prescription guidelines did not change during the two study periods, except for withdrawal of doripenem from August 2014. BLT was performed by a trained microbiologist on freshly isolated Enterobacteriaceae colonies as recommended by the manufacturer. Results were interpreted as positive if the colour turned red, purple or orange, and negative if the colour remained yellow. The cost of the device cost was 3.5 €. AST was performed by the disk diffusion method. If several Enterobacteriaceae were isolated in culture, the BLT and AST were performed on each species, and EAT was adapted considering the most resistant phenotype. In the conventional adaptation group (i.e. the controls), empirical beta-lactam could be adapted to results of microbiological sample culturing, notably Enterobacteriaceae identification, and then definitively adapted to AST. In the BLT-guided adaptation group (i.e. the cases), empirical beta-lactam was adapted to the BLT results (Fig. 1). When needed, the attending physician could secondarily adapt the BLT-guided beta-lactam to the AST. An appropriate antimicrobial therapy was defined as use of a beta-lactam active on the identified Enterobacteriaceae as determined by the AST as the gold standard. According to the beta-lactam classes defined by Weiss and colleagues , an “optimal antimicrobial therapy” was defined as the use of amoxicillin, amoxicillin/clavulanate or cefotaxime for wild-type Enterobacteriaceae; cefepime for AmpC-overproducing Enterobacteriaceae; and carbapenem for ESBL-producing Enterobacteriaceae. The sample size estimation was based on the chi-square test for comparison of two proportions. Assuming a proportion of 80% of appropriateness of EAT in the conventional adaptation group [9–11, 20], 60 patients per group were needed to show an increase to a proportion of 95% of appropriateness of the antimicrobial therapy in the BLT-guided adaptation group, with alpha risk of 5% and power of 80%. Differences in categorical variables were analysed using the chi-square or the Fisher exact test or the McNemar test for matched patients, as appropriate. Continuous variables were reported as median [interquartile range], and were compared using the matched-pairs Wilcoxon rank-sum test. Further, multivariate analyses were performed to determine variables independently associated with appropriate and optimal antimicrobial therapies. Both covariates known to impact the choice of EAT determined a priori and those with p < 0.20 in bivariate analyses were entered into multivariate regression models with variable selection based on a stepwise backward and forward elimination procedure using p values. All included patients were considered for analysis. A p value <0.05 was considered as significant. Statistical analysis was performed using GraphPad Prism 6 (GraphPad Software, San Diego, CA, USA) and R3.3.2 (http://www.R-project.org). From January 2014 to December 2015, 622 patients receiving EAT for suspected sepsis were screened for eligibility, among whom 154 patients had ≥1 Enterobacteriaceae strain isolated in culture; 61 of these patients were finally included as cases and were analysed in the BLT-guided adaptation group (Fig. 2). To recruit controls in the comparative conventional adaptation group, 671 patients receiving EAT from January 2012 to December 2013 were screened for eligibility, among whom 139 had ≥1 Enterobacteriaceae strain isolated in culture; 61 of these patients were finally included and analysed. Baseline characteristics of the patients included were similar in the two groups (Table 1). Characteristics of infections and EAT were similar in the two groups (Table 2). Pneumonia was the main source of infection. Fifty-six percent of patients had severe sepsis or septic shock. E. coli was the main Enterobacteriaceae isolated in culture, while inducible-AmpC Enterobacteriaceae were isolated in 24% of patients. Fifty-eight percent of Enterobacteriaceae were wild-type, while ESBL-producing Enterobacteriaceae were isolated in 20%. BLT BetaLACTA® test, GNB Gram-negative bacilli, ESBL Extended-spectrum beta-lactamases. Patients were empirically treated with cefotaxime (42%), piperacillin/tazobactam (27%) and carbapenems (19%), without differences between groups (Table 2). Fifty percent of patients received an aminoglycoside as empirical dual antimicrobial therapy. Eighty-four percent (51/61) and 77% (47/61) of cases and controls received an appropriate empirical beta-lactam respectively (p = 0.45) (Table 3 and Fig. 3). Once the results of the culture of the microbiological sample were available, no escalation of the inappropriate empirical beta-lactam occurred in the conventional adaptation group, whereas nine escalations were made in the BLT-guided adaptation group, reaching 98% of appropriateness (p < 0.01 compared to controls (see Fig. 3 and Additional file 3: Table S1 for individual descriptions). One false negative occurred in the BLT-guided adaptation group, for a healthcare-associated urinary tract infection due to acquired cephalosporinase-overproducing E. coli, empirically treated with Cefotaxime and definitively escalated to Cefepime according to the AST result after 64 hours. BLT-guided escalations occurred from 3GC (n = 3) and piperacillin-tazobactam (n = 6) to carbapenems. These nine cases were retrospectively reviewed and empirical beta-lactam complied to practice guidelines in all cases. The time between initiation of the inappropriate antimicrobial therapy and its escalation was 50.5 [48-73] hours in controls, significantly reduced to 27 [24–28] hours in cases with BLT-guided antimicrobial adaptation (p < 0.01) (Table 3). Forty-six percent (28/61) and 56% (34/61) of patients received an optimal empirical beta-lactam in the conventional and BLT-guided adaptation group respectively (p = 0.33; Table 3). Once the results of the culture of the microbiological sample were available, one adaptation occurred in the conventional adaptation group, while 26 adaptations were made in the BLT-guided adaptation group (43% of patients, 9 escalations and 17 de-escalations), reaching 95% of the optimum (p < 0.01 compared to the conventional group (Fig. 3 and Additional file 3: Table S1)). De-escalations occurred from carbapenems (n = 8) and piperacillin-tazobactam (n = 9) to cefotaxime. These 17 cases were retrospectively reviewed and the empirical beta-lactam had complied to practice guidelines in all but one case (piperacillin-tazobactam prescription that should have been carbapenem). The time between initiation of the non-optimal antimicrobial therapy and its adaptation was 58 (48–72) hours in controls, significantly reduced to 28 (24.5–47) hours in cases with BLT-guided antimicrobial adaptation (p < 0.01). BLT-guided early adaptations occurred more frequently in healthcare-associated than in community-acquired infections (18/33 vs. 8/28; p = 0.04). We performed multivariate analysis to determine the factors associated with appropriate and optimal antimicrobial therapies once the results of the culture of the microbiological sample were available. The following variables were entered into the model: age, Simplified Acute Physiology Score (SAPS) II severity score, presence of immunosuppression, recent travel in an ESBL-endemic region, ICU length of stay before inclusion, presence of associated bacteraemia, concomitant septic shock (vs. sepsis/severe sepsis), healthcare-associated infection (vs. community-acquired), pneumonia (vs. other sites of infection), positivity of microscopic Gram-staining examination for GNB, and use of the BLT to adapt antimicrobial therapy. In the final model, the presence of associated bacteraemia was associated with a lower rate of appropriate antimicrobial therapy (OR = 0.28 (0.08–1.01), p = 0.048), while BLT use was the only independent factor associated with a higher rate of appropriate antimicrobial therapy (OR = 18 (3.4–333.8), p = 0.006) (Additional file 4: Table S2). Similarly, use of the BLT was the only independent factor associated with a higher rate of optimal antimicrobial therapy (OR = 35.5 (9.6–231.9), p < 0.001) (Additional file 4: Table S3). No false positive results of the BLT and one false negative result (leading to a delayed escalation) occurred. Time to reach apyrexia or normal leukocytosis was similar in the two groups among patients with fever or hyperleulocytosis at diagnosis (Table 3). Length of mechanical ventilation in patients with respiratory failure, ICU length of stay and mortality were similar in the two groups (Table 3). Our main findings can be summarized as follows: in our study, the BLT-guided strategy led to: (1) a higher rate of appropriate antimicrobial therapy being administered due to early escalations of empirical beta-lactam prescriptions and (2) a higher rate of optimal antimicrobial therapy being administered due to early de-escalations of beta-lactam prescriptions that were too broad-spectrum. One of the most challenging problems in clinical practice is that despite the use of updated guidelines, about 15% of ICU patients receive inappropriate EAT [3, 9–11]. We observed a similar rate of patients receiving inappropriate EAT in this study. This is of particular concern because inappropriate EAT leads to higher mortality in the ICU . 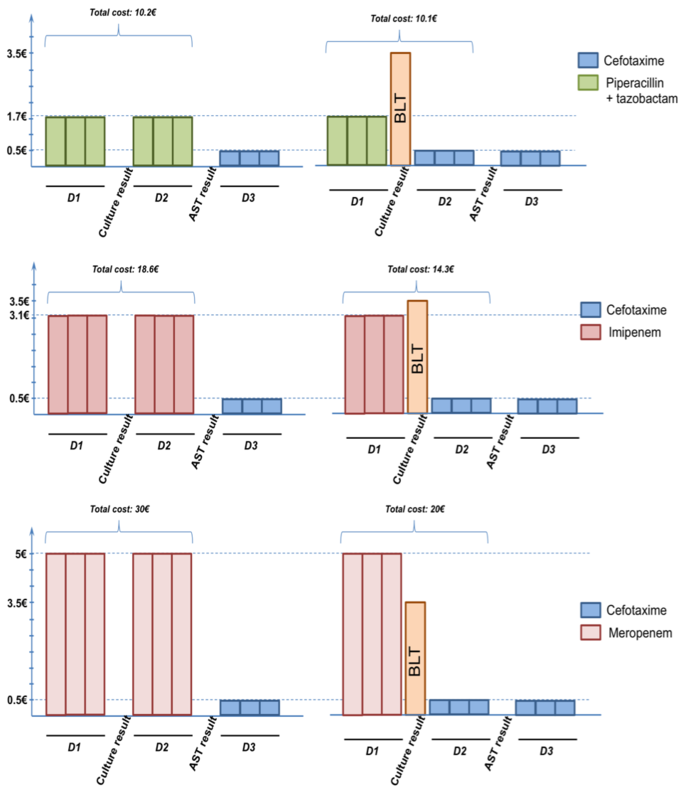 However, an across-the-board prescription of empirical carbapenems in the most severely ill patients is not acceptable, as the link between carbapenem consumption and the emergence of carbapenemase-producing Enterobacteriaceae or multi-drug resistant non-fermenting GNB is by now well-demonstrated [21–25], even with a short exposure . Thus, the World Health Organization  and national plans for controlling antibiotic consumption  have encouraged the development of rapid diagnostic tests evaluating bacterial resistance, which should ideally enable both early escalation in the case of inappropriate therapy and early de-escalation in the case of empirical therapy that is too broad-spectrum. To our knowledge, no test meeting these requirements has yet been validated for GNB in a clinical setting. Taking into account the very good diagnostic performance of the BLT [14–17, 27], we performed this pilot study and demonstrated that the BLT is a promising approach to reach this dual objective. Indeed, the BLT-guided adaptation of antimicrobial therapy independently increased its appropriateness and optimality to 98% and 95%, respectively, within a median of 30 hours before the availability of antibiotic susceptibility test results. Theoretically, this could have additive beneficial effect. First, by decreasing the duration of inappropriate beta-lactam therapy, the use of the BLT may be associated with improvement in infection cure. Second, by decreasing the patient’s exposure to broad-spectrum beta-lactams, the use of the BLT may be associated with better preservation of intestinal microbiota and lower acquisition of multi-resistant bacteria carriage , which have been suggested to contribute to better outcome . Due to the incidence of these events, demonstration of a BLT-related improvement in outcome would need additional studies including larger samples, especially as mortality may not be influenced by inappropriate EAT in the less severely ill patients  or in some low-risk sites of infection  in which definite antimicrobial therapy is appropriate. As for other diagnostic tests in the field of infectious diseases, clinical uptake of the BLT should be based on multifaceted evaluation . Although several studies have previously reported the very good intrinsic diagnostic performance of the BLT [14–17, 27], we reported its added clinical value for the first time, even when empirical beta-lactam antibiotic was chosen according to guidelines. The cost of the procedure also appears as strength since the device is inexpensive (3.5 €) and takes little time to perform (2 minutes for the assay and 15 minutes for the incubation prior to analyze the result). When compared with other biological tests, the BLT appears cost-effective. Indeed, its cost is quite similar to that of the disk-diffusion AST (3 €), and it is much cheaper than molecular detection of antibiotic resistance, such as GeneXpert® methicillin-resistant Staphylococcus aureus detection (18 €). To further illustrate the size of the required investment, in our institution the cost of BLT is amortized after the first and third doses of cefotaxime when de-escalating from carbapenems and piperacillin-tazobactam, respectively (Additional file 5: Figure S1). Our study may have several limitations. First, the number of patients included in each group may appear relatively small. However, according to the sample size calculation performed prior to the beginning of the study, the numbers were appropriate to demonstrate the superiority of the BLT-guided adaptation strategy in improving the appropriateness and optimality of the antimicrobial therapy once the results of microbiological sample culture are available. We did not observe differences in morbidity and mortality between patients treated according to conventional and BLT-guided strategies, but our study is likely to be underpowered to detect small differences in the incidence of safety parameters on the one hand, and improvement in the outcome of patients with early beta-lactam escalation on the other hand. Second, although the sensitivity of the BLT is above 95% for ESBL detection, lower sensitivity (around 60%) has been reported for detection of AmpC-overproducing Enterobacteriaceae [14, 15]. Indeed, we reported one false negative for a cephalosporinase-overproducing GNB, which led to delayed escalation to Cefepime, similar to what would have occurred without the use of the BLT. Nevertheless, our study demonstrated that this event is much less incidental in clinical practice than the BLT-guided early escalations of inappropriate EAT, suggesting a BLT benefit/risk balance in favour of its use. Finally, although our case-control study is the first to report the potential utility of a rapid phenotypic test detecting GNB resistance to 3GC in clinical settings, definitive evidence will require a large, randomized, controlled trial. Looking ahead, if the use of the BLT for Enterobacteriaceae colonies saves time in assessing the adequacy of antimicrobial therapy compared to the AST, recent developments could lead to another 24 hours being saved. Indeed, several protocols enable the efficient detection of Enterobacteriaceae that produce ESBL directly from the microbiological samples [17, 27, 31]. As such, it could be hypothesized that the direct use of the BLT on a microbiological sample that is positive for GNB on direct examination could shorten the duration of inappropriate EAT to a couple of hours. Despite the use of updated guidelines and a good compliance rating from physicians, one out of every six ICU patients receive inappropriate EAT. In more cases, empirical antimicrobial therapy is too broad-spectrum, which negatively impacts patients’ and hospital’s bacterial ecologies. The BLT is a simple, accurate, inexpensive susceptibility test, which is promising for early beta-lactam adaptation from the first 24 hours following the beginning of sepsis management. A randomized, controlled trial is needed to definitely demonstrate the impact of a BLT-guided strategy on the patient’s outcome. A comment to this article is available at https://doi.org/10.1186/s13054-017-1797-8. The authors thank Marie Lyager for English proofreading. This work has not been funded by any external source. MG conceived the protocol, included patients, analysed the collected data, and drafted the manuscript. SR contributed to protocol conception, collected data and corrected the manuscript. TP performed statistical analysis and corrected the manuscript. CQ contributed to protocol conception and drafted the manuscript. SV and SG performed the betaLACTA® tests and validated microbiological results. CB, MH and JPF included patients and corrected the manuscript. FB, JLM, MF and GA helped to draft and correct the manuscript. All authors have read and approved the final manuscript. All the authors declare that they have no competing interests in relation with this article. This study was approved by the Institutional Review Board (Comité de Protection des Personnes “Ile de France VI”, Paris, France, ID-RCB 2015-A00169-40), and by the French national commission on digital storage of personal data (CNIL, number 1832114). Due to routine introduction of a CE-marked test in our laboratory, patient approval was waived by the ethics committee. Consequently, information was given to patients or next of kin who could decline inclusion in the study. InVS/REA-Raisin. Surveillance de la consommation des antibiotiques (Antimicrobials consumption monitoring) (2011) [Internet]. 2013. Available from: http://www.invs.sante.fr/Publications-et-outils/Rapports-et-syntheses/Maladies-infectieuses/2013/Surveillance-de-la-consommation-des-antibiotiques-Reseau-ATB-Raisin-Resultats-2011. 14 June 2017. European Centre for Disease Prevention and Control. Antimicrobial resistance interactive database (2013) [Internet]. 2013. Available from: http://www.ecdc.europa.eu/en/healthtopics/antimicrobial_resistance/database/Pages/database.aspx. 15 Apr 2017. Organisation Mondiale de la Santé/World Health Organization. Projet de plan mondial pour combattre la résistance aux antimicrobiens (Draft global action plan on antimicrobial resistance) [Internet]. 2014. Available from: http://apps.who.int/gb/ebwha/pdf_files/EB136/B136_20-fr.pdf. 14 June 2017. Ministère français de la Santé (French Health Ministry). Plan national d’alerte sur les antibiotiques (National plan on antimicrobials) - 2011/2016 [Internet]. 2011. Available from: http://www.sante.gouv.fr/IMG/pdf/plan_antibiotiques_2011-2016_DEFINITIF.pdf. 14 June 2017.